Ross River virus is spread by mosquitoes, it’s quite prevalent in the warmer parts of Australia and is gradually spreading further south. It’s characterised by polyarthritis which causes your joints to swell, you get pretty bad pain and fatigue, and your muscles ache. Depression is part of the cocktail of this disease too. When Bryan first described how he felt, I told him I thought he’d got Ross River fever and at first I didn’t take it too seriously as I thought it was something that would clear up quite quickly. But I was quite wrong. My previously super-active partner sat in an armchair each day, wracked with pain, suffering chronic fatigue, and hardly able to move. He had always been a thin man but he got ever thinner and eventually ended up at six stone. Bryan saw a couple of locums who diagnosed Ross River fever. But when the local doctor returned, he told my husband that he couldn’t have Ross River because he was nowhere near Ross River. In blind prejudice, and without knowing anything of Bryan’s work history – a hard worker all his life – he decided that Bryan was faking his illness. This was despite the fact the two locums had diagnosed my husband with Ross River fever. In desperation, we eventually decided to go to a doctor in Ipswich in the hope of getting more decent, respectful treatment. I remember sitting there with my very sick, grey-faced husband and the doctor – a complete stranger who’d never met him before – looked at him, after we’d explained the situation, and said: “Well, I’ve never met you before, Bryan, but looking at you I see a very, very sick man.” What a relief to be taken seriously! Bryan was sent to a rheumatologist who carried out various tests, including the PSA test for prostate cancer, and I remember sitting there worried sick that he might have cancer. I needn’t have worried about that. Something else pretty devastating had happened. When Bryan came out of the doctor’s surgery he looked shell-shocked. Ross River fever sparks polyarthritis and this had affected vertebrae in his back which had been damaged by heavy work on building sites, an accident when he had a bad fall on a building site, and getting blown up and badly injured while serving in the British Army in Cyprus. The rheumatologist told Bryan that if he attempted any heavy lifting, he could damage his back further and end up paralysed. He advised my partner to stop work immediately. So my husband’s working life had come to an end overnight, so to speak. We drove back to Boonah, very silent and, I think, very depressed about our financial future. One thing we knew we’d have to do and that was sell our home as the block was too big for Bryan to maintain due to his ill-health. And as I still had a gammy leg from my fall, there was no way I could keep the block under control. A turning point in all this downhill race was that Bryan became eligible to move to the disability pension. We had no idea that this was a better payment, we simply knew that my partner was now officially disabled and so it made sense to apply for the pension. The switch from unemployment benefit to disability pension happened without a hitch, and we found to our surprise that we were slightly better off financially. We could get pensioner discounts on rates and electricity. And the rate of payment was higher than the unemployment benefit. Very reluctantly we put the house up for sale. It was still a rock-bottom market and nothing happened for a while. Bryan would recover somewhat from Ross River but then have to mow the block to keep the grass under control, and he’d go backwards again health-wise. 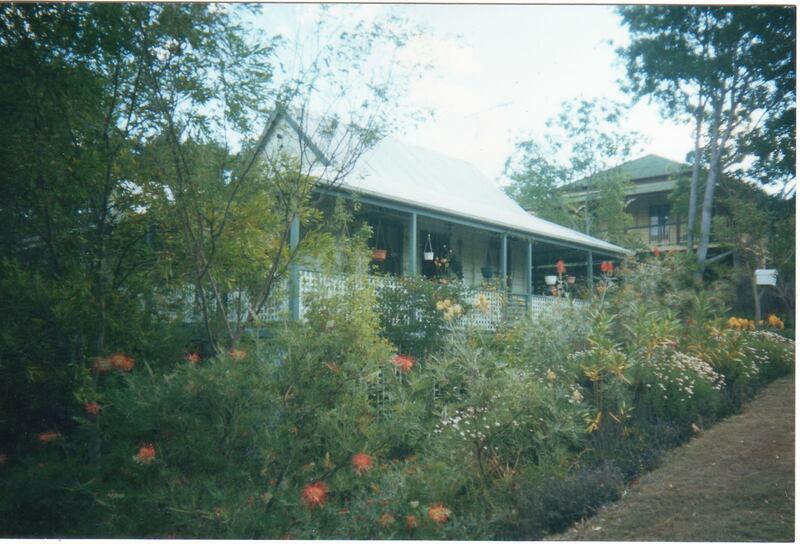 We really wanted to leave Boonah but, however much we were itching to move, no offers appeared. Eventually we got one offer, which would mean a loss of $25,000, a really devastating hit on our finances as by then we had exhausted our savings. However, we decided we were selling in a depressed market but we were also buying in the same market. 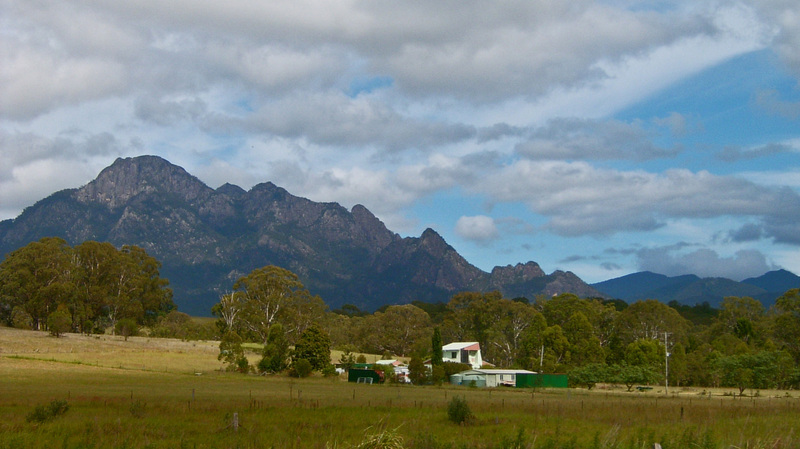 So we went looking for a house in the Boonah district. What did occur to me later was that, as long as we wanted to quit Boonah and move elsewhere, nothing happened. But as soon as we decided we would stay in the town, particularly as we were both still in fairly poor health and couldn’t handle a major move elsewhere, the situation changed. It was as if we were meant to remain in Boonah for the time being. I later realised that this is what happens to people who get drawn, quite unconsciously, to this area. I lost track of the number of people who I queried about their reasons for ending up in the town. 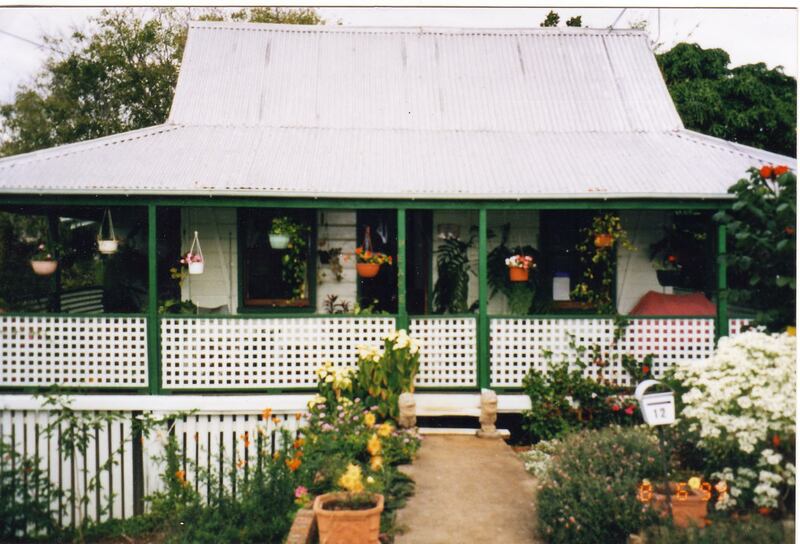 They all looked puzzled and said it was by accident (like us), or they had a vision of Boonah for a long time (Yvonne), or liked the look of the town when they visited. Looking back, it was as if the area attracted people, turned them inside out and then, once they’d had their shake-up, sent them on their way. Those who really changed in some fundamental way left the town to carry on their new lives elsewhere. At the time we were selling our home, however, I had no idea this sort of energy vortex existed. We were desperate to move as we were getting close to bankruptcy. 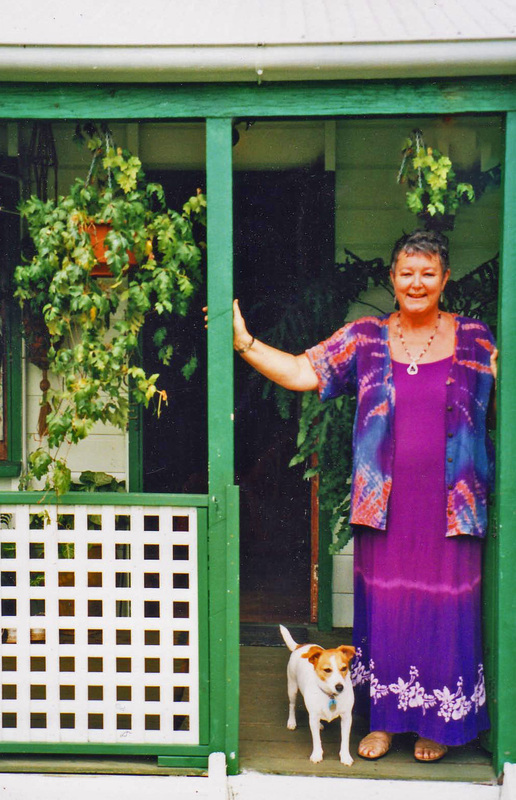 I do remember looking at a picture of a house in Boonah and being attracted to the good energy which surrounded it. I insisted on looking at it, although our real estate agent tried to head us in the direction of another, grotty house he obviously wanted to get off his books. The house we went to look at was a cottage, run-down, a bit seedy but with a really lovely, large garden and lots of bounteous trees providing shade and a richness to the whole block. It was about two minutes from the town centre and in a quiet cul-de-sac. We put in an offer which was accepted. 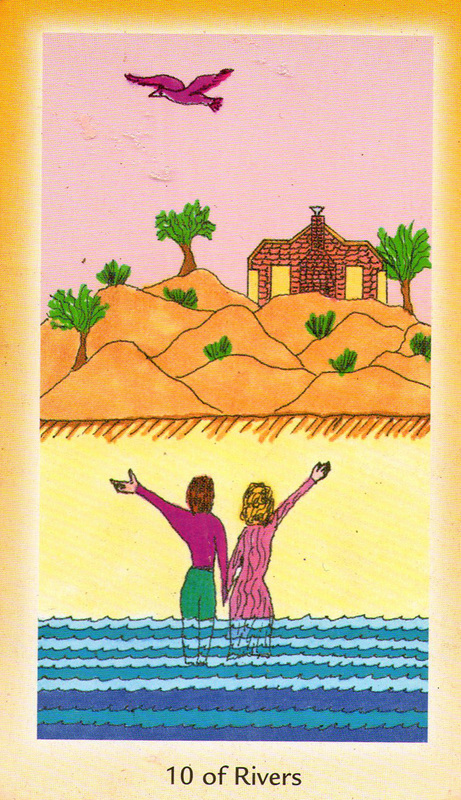 And we accepted the offer on our home, with a heavy heart but with no choice given the state of our health and finances. Just to wind up our bleak time at Mt French, our dear old Mr Smudge came running in howling in the early afternoon, the day we signed the contract of sale. He was obviously very ill and I drove with him at breakneck speed to the vet’s. He’d been hit by a car and had to be put to sleep due to the injuries he had sustained. I held him in my arms and he purred as he slipped into the beyond. It was such a sad end to such a loving, kind and affectionate cat, and we were devastated. At the same time, our last cat, Jessie, had a hard lump on her cheek. The vet operated and we found she had a cancer in her saliva gland. We hoped the surgery might clear it up, but within two weeks, it was clear that Jessie was dying and we had to repeat the trip to the vet’s to have her put to sleep. Thank god our little Jack Russell, Rosie, remained in good health. I remember arriving back at our home and looking at Jessie’s little body in the back seat and feeling grief overwhelm me. We had been through so much heartbreak, sadness and despair in this house, and the loss of our two cats seemed to set the seal on a period of our lives which had been far from our excited expectations when we had set off from Perth with such high hopes. I cried so much that day in a way I’ve never cried before or since. It was as if I’d got through everything trying to be positive and cheerful, burying the hurt and setbacks deep within, but Jessie’s death opened the floodgates. I sobbed my heart out all day, utterly unable to stop. It was absolutely gut-wrenching, those deep cries of pain from deep within which erupt and there’s nothing you can do to stop them. When we walked out of the house, we did so with enormous relief. Whereas we’d been sad to leave our home in Fremantle where we’d lived for ten years, we never looked back at the house on Mt French as we drove away. But, as it happened, the end of our Mt French misadventure heralded a complete turning point in our lives and from then on, we never looked back. 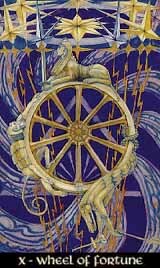 In the Tarot the Wheel of Fortune can very often mean a turning of the wheel to more fortunate circumstances in life and that’s what happened once we’d left our home on Mt. French. It was, by the way, a No. 1 house in numerology which means completely new beginnings, a clear-out of the old and a fresh start in life. It was if our old life had been completely ripped away from us, we had been turned inside out and in our new home we were embarking on a completely fresh life. A true Dark Night of the Soul which I can see, looking back, brought us great blessings but, god help me, I never want to go through anything like that again! 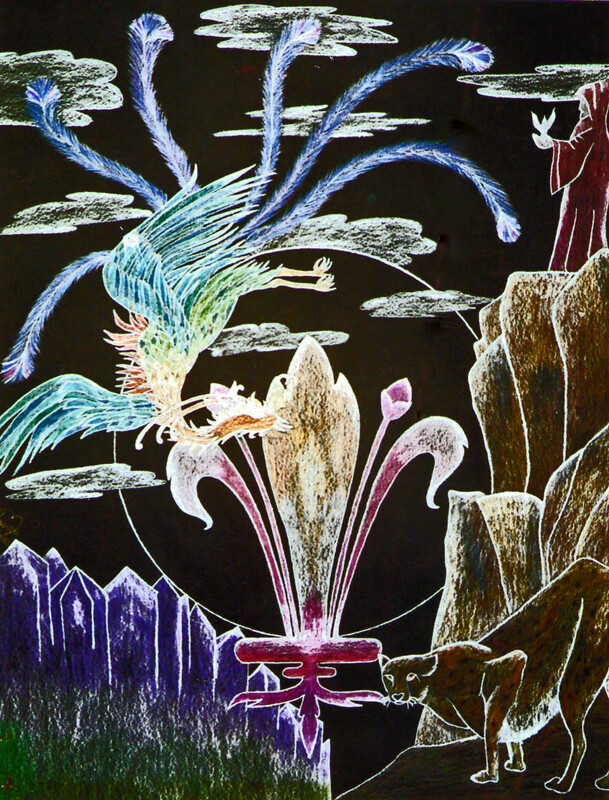 Rachel Pollack’s Shining Tribe Tarot image for 10 of Rivers: waving goodbye to the past, saying hello to the future.